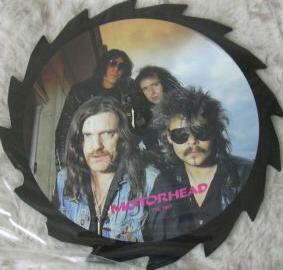 Sawshaped picture disc. Later re-issued as a batshaped version. Has a colour picture of the band from about 1987 on the front with band name in pink and the cat no "TTS 1007". On the back there is another colour picture from the same photo session and you can also read "Limited edition interview picture disc"
(P) (C) 1988 Tell Tales, Warning, some of the language in this interview may be offensive. Each interview disc is presented independently and without collaboration of the artists. This enables us to produce items without artistic or management censorship, which means that we can often present a wider view of the artsts and their opinions. All trademarks remain the property of the artists and/or their affiliates or assignees and not of TELL TALES. Made in England.